The long-planned rail trail gathered steam last week, as train tracks were pulled up along the Passagassawakeag River. BELFAST, Maine — The long-planned Rail Trail along the Passagassawakeag River in Belfast is a lot closer to reality, after a company hired by the city has made big progress in pulling up two miles’ worth of railroad tracks and rails. City Manager Joe Slocum said that all the tracks and rails are expected to be pulled up by the end of this week, adding that this portion of the project has been a big bargain for Belfast. The company is pulling up the tracks and the old wooden rails in exchange for the value of the metal and a payment of just $500 from the city, which also is “moving swiftly” to build a deck over the railroad trestle bridge located close to City Point, he said. When complete, the trail will begin at the downtown waterfront and extend for about two miles up the river, coming to a terminus at City Point. Slocum said he hopes that by next spring or summer, the 10-foot-wide trail will have a stone dust surface, similar to the carriage trails at Acadia National Park. It will not have amenities such as street lights or trash cans, but it will offer a way to access a beautiful, natural part of the city that is minutes away from downtown, Slocum said. Officials estimate that it will cost about $600,000, and the city is working with Coastal Mountains Land Trust to help raise those funds. 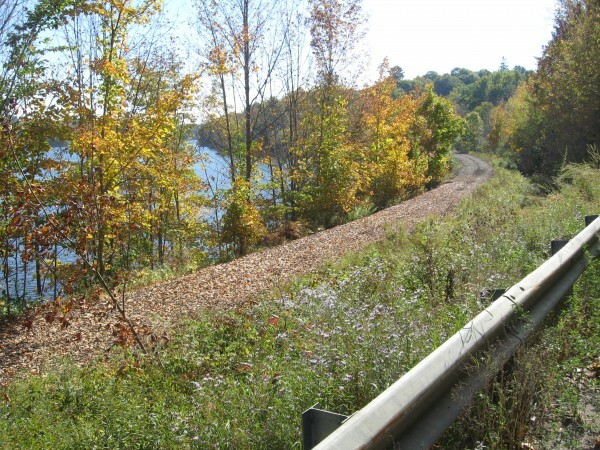 The trail will run on a portion of the old Belfast & Moosehead Lake line. The railroad operated from 1871 to 2007, carrying passengers and freight along a 33-mile stretch of track from Belfast harbor to Burnham Junction. Beyond City Point, the Brooks Preservation Society continues to run excursion rail trips on a portion of the line. The city entered into a partnership last fall with the nonprofit group of railroad enthusiasts, and has purchased the rights to develop a parking lot, build bathrooms and secure access to the trail’s terminus at City Point for an initial outlay of $35,000 and additional payments of $5,000 a year for 15 years. This past spring, the federal Surface Transportation Board approved Belfast’s request to “rail bank” the two miles of tracks, giving the city permission to pull up the tracks and discontinue the railroad for an indefinite amount of time. City officials and residents like Hutchings said they are looking forward to the day the trail can be joined to the half-mile long Harbor Walk, which runs along the waterfront from the Belfast footbridge to the Belfast Boat House. An energetic person then could start downtown, walk to City Point along a dedicated path and circle the river estuary on Kaler and Robbins Road, crossing back to downtown on the Armistice Bridge. The rail trail cannot now be connected with the Harbor Walk because the railroad crosses the Penobscot McCrum potato processing factory site on the waterfront, and the owner does not allow the public to travel back and forth there. Slocum said that city officials are “always talking” to Jay McCrum, the owner, about his concerns. McCrum told the BDN this week that he has to protect his business from liability and also has to take federal food safety laws into consideration. The company has offered the city additional parking space close to the footbridge, but has been advised by its insurance company and lawyers to be very careful regarding the idea of opening up the trail across the property. Slocum, however, said that Maine law protects landowners who allow property to be used for recreational purposes. He also said that down the road, connecting the trails will be an important economic driver for the city, adding that it is the kind of resource likely to appeal to people of all ages. “The rail trail will be an attraction to the region,” he said.